A young woman in a vest top. Lycra led to closer fitting vest tops in the late 2000s and the 2010s. A camisole typically has thin "spaghetti straps" and can be worn over a brassiere or without one. Since 1989, some camisoles have come with a built-in underwire bra or other support which eliminates the need for a bra among those who prefer one. Starting around the 2000s, camisoles have been known to be used as outerwear. ↑ Little, William G.; Coulson, Jessie Senior; Fowler, H.W. (1975). Onions, C.T., ed. The shorter Oxford English dictionary on historical principles. Oxford: Clarendon Press. p. 272. ISBN 0-19-861126-9. 1816.... 1. Formerly applied to jackets of various kinds. 2. A woman's underbodice 1894. ↑ Timothy J. Kent (2001). Ft. Pontchartrain at Detroit: A Guide to the Daily Lives of Fur Trade and Military Personnel, Settlers, and Missionaries at French Posts. Detroit: Wayne State University Press. p. 553. ISBN 978-0-9657230-2-2. Retrieved 2009-01-15. ↑ "camisole definition: Dictionary.com Unabridged (v 1.1)". Random House Unabridged Dictionary. Random House. 2006. Retrieved 2009-01-15. 1. a short garment worn underneath a sheer bodice to conceal the underwear. 2. a woman's negligee jacket. 3. a sleeved jacket or jersey once worn by men. 4. a straitjacket with long sleeves. ↑ "AskOxford: camisole". Compact Oxford English Dictionary of Current English. Oxford University Press. Retrieved 2009-01-15. a woman’s loose-fitting undergarment for the upper body. — ORIGIN French, from Latin camisia ‘shirt or nightgown’. ↑ Scott, Lucretia M. (1987-09-22). "Camisole underwire bra garment description - US Patent 4798557". Retrieved 2009-01-15. Up until the present time when a woman wished to wear a camisole due to its loose fitting nature and she still required support for her breasts, she was required to wear a bra underneath her camisole to achieve the desired results. ↑ Thatcher, Virginia S., ed. (1970). The New Webster Encyclopedic Dictionary of The English Language. McQueen, Alexander. Chicago: Consolidated Book Publishers. p. 116. ISBN 0-8326-0021-0. A short light garment worn by ladies when dressed in negligee;strait jacket for lunatics or criminals condemned to the guillotine. ↑ Ruth La Ferla (25 October 2007). "Now It's Nobody's Secret". The New York Times. Retrieved 2007-11-23. ↑ "Composite support system - Application 20060166600". Retrieved 2009-01-15. Wikimedia Commons has media related to Camisoles. 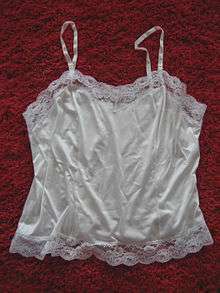 Look up camisole in Wiktionary, the free dictionary.